For years, public policy debate in Canada about child care has largely been defined by the licensed child care industry. In most jurisdictions child care policy focuses almost exclusively on licensed care, and parents who need public financial assistance are, with few exceptions, required to accept licensed child care as their service model. In many respects, the licensed child care industry’s dominance of public policy can be said to represent a regulatory capture — in effect, the public interest in the subject is filtered through the lens of industry interests. But how does the dominance of the licensed child care industry square with actual parent preferences in their choice of child care formats? This paper examines three empirical studies on child care preferences carried out over a period spanning nearly three decades: The 1988 National Child Care Study; a 2001 provincial study conducted by Saskatchewan Social Services; and, a 2013 national poll sponsored by the Institute of Marriage and Family Canada. other out-of-home options such as nursery school or before/after school care. As we shall see, the results of these three studies are quite consistent over time and geography, and suggest that most parents do not agree with the perspective on child care offered by the licensed child care industry. The National Child Care Survey (NCCS), with more than 24,000 respondents, was conducted in 1988. One of its stated objectives was “[t]o obtain information about parents’ preferences among work and child care alternatives …” (Canada, 1992). The parent preference results from the National Child Care Study were never published, leading to concerns in parts of the policy community about the objectivity of the study’s management. The results for working parents with children under 6 are shown in Figure 1. From this chart it can be seen that parents’ preferences are very strongly weighted towards home and family, with only about a quarter indicating a preference for a licensed day care option. In order to focus more precisely on preference in infant care, a similar analysis was conducted, but this time selecting only where the target child was under 2 years of age. The results are displayed in Figure 2. From this it can be seen that working parents with very young children have an even stronger preference for family-based care. 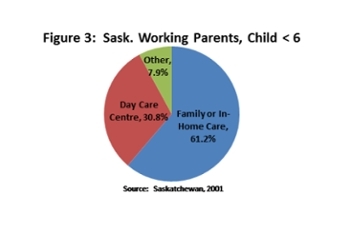 The 2001 Saskatchewan Child Care Needs and Preferences Survey (Saskatchewan, 2001) was a free-standing survey of 1,273 Saskatchewan households with children under 13. The purpose of the study was to explore child care arrangements, preferences and needs, to identify child care challenges and issues, and to assess opinions about the expected role of government in child care issues. The Saskatchewan research used a preference question essentially identical to the NCCS: “Given your current work schedule and your present income, which type of arrangement would you most prefer for your [child / children] while you are working?” As with the NCSS, the question would seem aimed at eliciting a practical preference, rather than an ideal. The results for parents whose youngest child is under 6 are shown in Figure 3. As can be seen, a significant majority of parents preferred a home and family option. Figure 4 shows the results for parents whose youngest child was under 2 years of age. For these parents the preference for home and family care is even stronger, at just under two-thirds of respondents. The Institute for Marriage and Family Canada describes itself as an organization focused on research that supports marriage and familyfriendly policy. 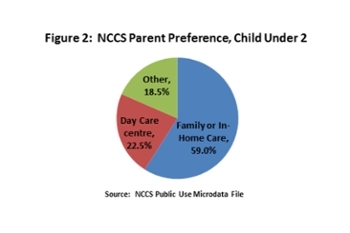 The organization recently released the results of a national survey on day care attitudes and preferences, conducted via an on-line panel (IMFC, 2013). The IMFC survey included respondents with and without young children in the household. For purposes of this analysis, respondents were selected who reported having a child under 6 in the household and who were working full or part-time. 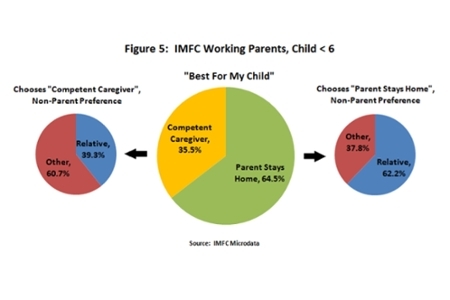 The IMFC survey attempted to assess both an ideal child care arrangement, regardless of circumstances, and a more practical preference should options be constrained. Two questions were posed. Respondents were first asked if they believed that it was best for children to be in the care of a parent, or another competent caregiver. They were then asked, assuming that parental care was not possible, whether they would prefer to place their child in the care of a relative, or another competent caregiver. The two-layer structure of the preference questions creates challenges of direct comparability to the other two studies. However, charting the layered results of the question pair (see Figure 5) strongly supports some qualitative conclusions. if a parent was not an option. Of the roughly one-third indicating that a competent non-parent caregiver was their ideal preference, about 40% consider a relative as the preferred non-parent caregiver. The above analysis provides a body of empirical evidence that Canadian parents are strongly oriented towards a “home and family” approach to child care for pre-school children. This contrasts sharply with the narrative that defines child care needs in terms of licensed child care spaces. These three studies would suggest that parent preferences have been consistent over time and consistent across geographic areas. Conceptually, one might visualize parent perspectives emerging from this evidence as in Figure 6. The dominant preference is care by parents, relatives or in-home caregivers. Out-of-home options, including licensed child care, are a relatively peripheral option. These results might help explain, for example, why a long-standing federal Liberal commitment to a national child care plan would lie dormant and unfulfilled, one suspects due to lack of popular support. At this writing licensed child care does not feature prominently in the Liberal program, although it certainly does in the platform of the New Democratic Party. The federal Conservative Party seems to have made the Universal Child Care Benefit, a fungible benefit much reviled by licensed care advocates, a core part of its electoral strategy. How can such dissonance exist, and be sustained, between parents’ perspectives and the dominant policy perspective of the licensed child care industry? The answer appears to lie in bias, rooted in a hardened ideology, among those with substantial influence over child care policy. A particular historical narrative about child care and women’s employment has become widely accepted, that war opened opportunities for women in the work force, and that state-involved child care support was an important factor in the expansion of women’s employment. That war in the twentieth century increased women’s paid employment to some degree is undeniably true. Female civilian employment in Canada increased from 873,000 in 1939 (21% of the civilian work force) to 1,394,000 (31%) in 1945 (Canada, 1957). However, it is not at all clear what proportion of these new female Canadian workers consisted of mothers of young children, at least according to currently-available sources. In Britain, more detailed statistics reveal an extremely low participation rate for mothers of young children late in the war - only 13% - despite rather concerted efforts to woo young mothers into paid employment (Calvocoressi & Wint, 1972). The evidence for a role for day care in women’s war employment is also weak. The British government put considerable effort into child care, with little effect on employment rates among young mothers. In Canada, while some funds were allotted to develop day care facilities, most were left unspent outside a few locations in Ontario and Quebec, where most industry was concentrated (Dougherty et. al., 2003). Through a cascading series of assumptions, however, influential feminist thinking quickly hardened in the post-war years into an almost immovable ideological commitment to state-supervised and subsidized child care as key to increasing the labour force participation of women. The report of the Royal Commission on the Status of Women in Canada (Canada, 1970), for example, argued that not all women were good mothers, and the “mother substitute” role of day cares could guard against the potential harm from “the over-protection and possessiveness which may result from a mother’s undivided attention”. The commission dismissed opposition to a dominant state role in child care as “misguided”. The report went on to inveigh against “the danger of … permitting child care arrangements in unlicensed and unsupervised households where parents make contact through classified advertisements in the daily newspaper.” The report recommended, rather remarkably, that only day cares – not parents – be allowed to place children in unlicensed child care arrangements (pp. 261-267). The strong biases of women’s advocates toward this specific form of care - the state-licensed, institutional child care centre - seems to have resolved itself into a de facto article of faith among influential professional women, including professional politicians. One result of this policy capture of child care has been a restriction of choice for parents. In Saskatchewan, for example, regulative influence by the day care industry has largely suppressed the market for provision of other alternatives, which are referred to rather condescendingly by the industry as “informal” care arrangements. Even if alternative service formats were readily available, in most cases parents can access child care subsidy only through the licensed day care system, even though licensed spaces are - and likely always will be - severely restricted in availability due to their very high costs, and the organization of so many day cares as small independent institutions, each with considerable governance and administrative overhead. The argument remains to be addressed, as posed by the Royal Commission’s authors, that day care may be better for children than the care of parents or close relatives. It is not the purpose of this paper to consider the considerable body of evidence comparing employment and child development outcomes of various approaches to child care. Suffice it to say, however, that far too much of what is promoted as scientific research in the area of early childhood care and education has a stronger air of ideological advocacy than objective evidence. Where hard evidence is brought to bear, outcomes could be considered mixed. In the absence of a compelling base in evidence to justify family and societal benefits, the current public policy bias towards licensed child care would seem unjustified. Canada has a history of subsidizing parents, and particularly low income parents, to reduce the costs of raising children. Canada also has a history, however, of attempting to force the licensed child care model on parents, using both regulatory and financial means. This, I would argue, is wrong. 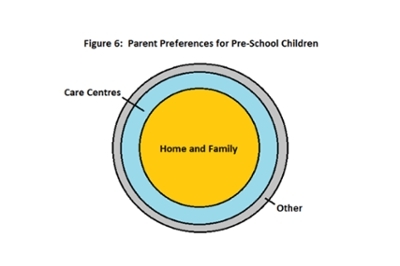 The three studies examined in this policy brief suggest that focusing child care policy on a single model, the state-licensed and supervised child care centre, is substantially at odds with the perspective of most parents of young children. This has remained the case through a quarter-century when the licensed day care industry has dominated public policy discourse on the subject. From a common-sense perspective, this should be no surprise. Childraising, to understate the obvious, is an intensely family-focused enterprise. It is more than natural that parents would trust themselves first and foremost, and that, when obliged to seek care other than their own, they would seek out options as close as possible to home and family. The key question for Canadian governments is this: why is this family-oriented perspective so little reflected in public policy? There is no apparent reason that licensed child care should not be available as an option for parents, who may feel that the state’s licensing role provides a quality or safety assurance. There is equally no reason for the state to so strongly promote this particular option through endorsement, regulation, supply management and subsidy. This paper does not address the quality-of-care arguments for and against any particular approach to child care. Suffice it to say, however, that the debate on care quality and child outcomes, driven as it so often is by ideological motives, should leave the objective observer unconvinced that institutional day care is in general superior to parent or family care. It is possible that the majority of parents are wrong in their declared preference for home and family care. Governments, however, should have a solid public policy rationale for imposing unwanted approaches on citizens, especially in such a sensitive and important area as care of children. This analysis points to a need for a hard and critical look at the biases embedded in current government policies and programs. Canada’s policies towards early childhood are still in flux. This provides an opportunity for governments to make a difference for families and children, and through them to reinforce the substance of Canadian society. It would be unwise to underestimate the complexity of family policy, involving as it does issues of family and social dynamics, labour force attachment and, not least, public finance. There is a strong argument to be made, however, that, as Canadian family policy is further developed, the views and preferences of parents should be considered and respected. Calvocoressi, Peter & Guy Wint. Total War: The Story of World War II. New York: Pantheon Books, 1972, p. 394. Canada: Dominion Bureau of Statistics. Canadian Labour Force Estimates, 1931-1945. Reference Paper No. 23 (Revised). Ottawa, 1957. Canada: Information Canada. Royal Commission on the Status of Women in Canada. Ottawa, 1970. Canada: Statistics Canada. Canadian National Child Care Study: Introductory Report. Catalogue 89-526E. Ottawa, February 1992. Dougherty, Gillian, Martha Friendy & Jane Beach. OECD Thematic Review of Early Childhood Education and Care: Canadian Background Report. 2003. Institute for Marriage and Family Canada. Canadian Daycare Desires. Ottawa, May 2013. Saskatchewan. Social Services. Research Report: Saskatchewan Child Care Needs and Preferences Survey. December, 2001. Rick August is an independent social policy analyst and consultant based in Regina. He is a former Saskatchewan public servant with over forty years of experience in the social policy field. He had a direct role in the creation of the National Child Benefit and in the implementation of a number of Saskatchewan programs aimed at reducing poverty through labour force attachment. He was the social policy editor for the Saskatchewan Encyclopedia and has published works in recent years on economic inclusion, active disability policy, the structural reform of income security programs and other subjects. Detailed data tables for the research discussed in this policy brief are available from the author on request. The author thanks the Institute for Marriage and Family Canada for making raw data from its survey available for analysis.